Do means of transport mean more than you originally thought? I went home for the first time this past weekend only to come back to campus and find that my front bicycle tire was flat. This wasn’t too big of a deal, because I didn’t have a bike for the first several weeks of school and I knew how the walking deal went: give yourself 15 minutes to get anywhere on campus. I proceeded to walk to class for the day, along with the following two days. This post was inspired by the pain I am now enduring in my shins. Who knew that a month of not walking to class consistently (and riding a bike instead) could get my legs so out of shape?! I know that each of these gross motor skills requires very different use of muscles, but I was still so surprised to find my legs to be so sore! As I was walking downtown this afternoon to get my front tire fixed, I began thinking about which of the two options– biking or walking– was ultimately better for my overall wellness. 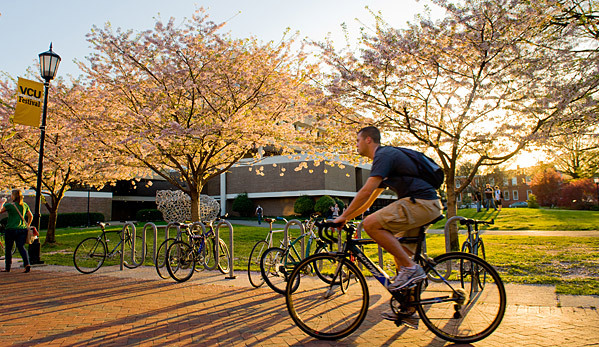 All of us see hundreds of pedestrians every day when walking from one place on campus to another, but we also see many more bikers on this campus than on most. (As a side note, I’m going to continue to ride my bicycle as it allows for a much quicker transition time between classes. But for the sake of this blog post, I want to compare the two). First I wanted to learn about cycling. Are there any health benefits or dangers that make it a better or worse option than simply walking? Rather than researching a single study, I chose to look for information on this topic in a meta-analysis–as cycling is a very prominent topic of study and is extremely relevant to the general public. The meta-analysis that I found included results of many different types of studies, including cross-sectional, case-control studies, and intervention studies. This included 16 studies total, with only two finding that cycling was potentially harmful to human health. The cross sectional and longitudinal studies all found that a consistent positive relationship between cycling and cardio-respiratory fitness in youth. All but two of the case-control studies discovered a consistent inverse relationship between commuter cycling and cancer mortality among middle aged adults to elderly adults. The intervention studies also revealed positive results in their discovery of clear cardiovascular improvements. Aside from the fact that this meta-analysis wanted only to look at health factors and not confounding variables such as the use of helmets, it discovered that overall–biking can absolutely maintain and improve human health conditions, especially the cardio-respiratory and cardiovascular systems. Next I wanted to look into long distance walking and the benefits or potential dangers that came along with. My typical route to and from classes, in addition to any other movement I do in a day (i.e. going to the gym, getting dinner at the dining commons, etc.) adds up to be about 3.5 miles on average. I figured this out, back in my days of walking when my phone would alert me that I had reached a daily goal that I had somehow set up. 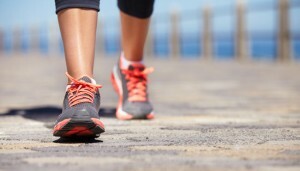 Good news for those of you that do have longer routes throughout your week: walking is one of the most underutilized yet best forms of physical activity. It is considered moderate-intensity physical activity which is recommended universally, and regardless of age. The most interesting thing that I found about walking, however, is that it has been found to increase in significance to health as the population ages. Consistently walking has been shown to decrease obesity, chronic disease in older individuals, and reduce the risk of injury in people. To conclude, both cycling and walking ha ve tremendous health benefits. While both are prominent ways to get around as a college student, what makes one better than another is that walking is universal. By this I mean that it requires absolutely no equipment, training, etc. Biking requires certain conditions that cannot be found everywhere. So bike or walk? It really ends up being personal preference. The important piece to take away from this though, is that consistent physical activity like cycling or walking each and every day is going to help keep you healthy. And staying healthy is what is really important in the long run. Lee, I., & Buchner, D. M. (2008, July). The Importance of Walking to Public Health. Medicine & Science in Sports and Exercise, 40(7), S512-S518. Retrieved October 19, 2016, from Ovid. Oja, P., Titze, S., & Bauman, A. (2011, August). Health Benefits of Cycling: A Systematic Review. Scandinavian Journal of Medicine & Science in Sports, 21(4), 496-509. Retrieved October 19, 2016, from Wiley Online Library. This entry was posted in Uncategorized on October 20, 2016 by Sarah Elizabeth Read. I have always been used to walking places so when I first came to Penn State I thought I would keep that streak going. I rarely ever take the bus since because I enjoy walking to class and getting exercise while doing it. Biking is a great way to exercise don’t get me wrong, but I think walking is more effective when you are on a campus this large and want to get in a short workout. The bright side about biking is that you will most likely not get shin splints, like you said you did when you started to walk to class again. With very little downtime to go to the gym and workout, I have always looked at my long walks around campus as something to keep me from getting completely out of shape. However, biking could save me time getting around which could give me more free time to workout. This makes biking versus walking a question of a person’s rational. Is the price of a bike worth it? Is the time walking takes worth it? This article http://www.kavlifoundation.org/science-spotlights/neuroscience-of-decision-making#.WAjlejtll-U explains the mechanism behind a person’s personal rational and decision making. A person will choose biking or walking based on what they perceive is worth it for them. Biking and Walking are two activities that are always fun to engage in, especially when you go for a ride or walk with friends as well! One thing to keep in mind, regardless of which activity you prefer, is that you are being engaged vigorously for the recommended time you chose to devote towards exercising and maintaining a healthy body. Only have time for a ten minute work out? Better get ready to work hard for those ten minutes to push yourself to your limits! Have an hour to allot instead? Feel free to take a more brisk approach with only slight periods of escalation in between. Either way, learning how to manage your time and properly adjust your workout to fit within those constraints is key to achieving your recommended target heart rate zones and ultimately improve your health in the long run (http://www.hanford.gov/health/?page=112). I found your post to be very informative as well, and enjoyed reading it, but maybe next time you could benefit from using one more additional image or video to really make your blog feel complete. Otherwise, well done, and I wish you the best of luck with the rest of the semester! This post interested me because ever since I got to school I have wondered if all the walking I do to and from class is beneficial in any way. When I walk to class I usually feel like I just worked out because depending on how fast my pace is, I am short of breathe and a little sweaty. At the beginning of the school year I looked into if walking to class is considered a workout. Sometimes I can’t make it to the gym during the day, so I would be reliant on having walked to class as my daily does of exercise. I had found this article during my research. http://www.webmd.com/fitness-exercise/features/is-walking-enough#1 I know not to fully rely on just walking to class as my only source of exercise, but I am reassured that it is still benefiting me when I can’t make it to the gym. Through the research I did after reading this post, it is clear to me that biking for an hour would burn more calories than walking for an hour. However, in a situation like ours where we are traveling relatively short distances to class (and biking at a leisurely pace) walking would burn more calories. I believe the freshman 15 doesn’t exist here at Penn State partially because of the amount one walks here. Whether walking to class, into town to get food, or down frat row the steps pick up dramatically. I have a fit-bit which tracks my steps. When i looked back at my walking history I found that in the summer I was doing at most 8,000 steps a day. Now I am a busy college student moving around all day I found I walk over 20,000 steps a day. After reading your blog I was informed by all the benefits walking has an will make me second guess myself when I see a white loop on the way. I believe fit bits make people walk after I saw the competition my mom and dad had on who walks more. Here is an article of users going the “extra mile” because of this device. I found this post really interesting and informational. Some of my classes take around 20 minutes to walk to, so I’m happy to read that walking is one of the best forms of exercise. I was never that into riding bikes before but I did some more research on this topic and found this article (https://www.betterhealth.vic.gov.au/health/healthyliving/cycling-health-benefits) that lists many benefits of cycling daily.